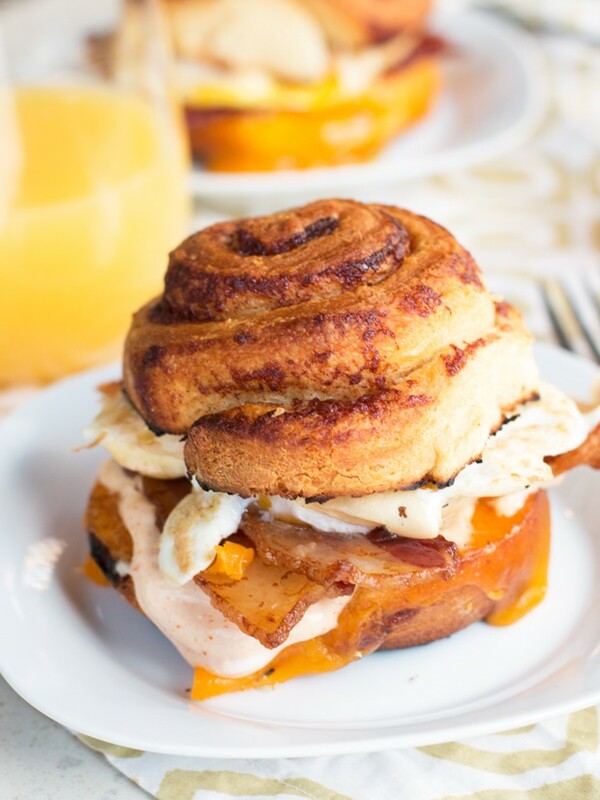 Ultimate Mountain Breakfast Sandwiches are my ultimate way to start the day! 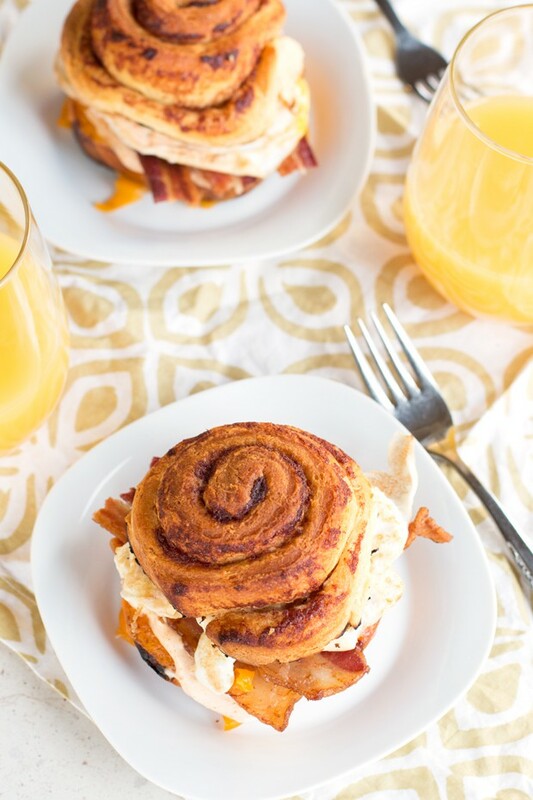 It’s got everything you love about breakfast in every single bite, from bacon and eggs, to cheese and cinnamon buns. This is how you kick off a day on the slopes. Remember that time I made apple mojitos and mentioned fall was almost over and it was time to embrace fall as much as possible? Yea, then it snowed… That’s Colorado for ya! Now that the first snow has fallen in Denver, and disappeared just as quickly, I am ready to hit the slopes. This is the year I become an expert snowboarder, or at least get down a black without dying… I feel like I say this every single year, but this year it’s definitely happening. I’m even joining a few Meetups (anyone tried these and had them be fun…?) so I have more people to get up into the mountains with. Oddly enough, most of my friends don’t ski or board (I’m giving you all who are reading this the stink eye right now, btw). Naturally thinking about getting up into the mountains gets me thinking about breakfast. I love stuffing my face at the beginning of the drive up in to the mountains. Usually it’s a breakfast burrito or a breakfast sandwich, something that’s easy to eat and somewhat portable. That’s exactly what inspired this ultimate mountain breakfast sandwich. 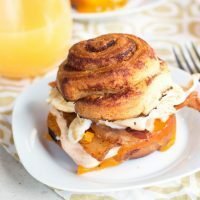 I have been craving both sweet and savory in my breakfasts lately, so I smashed all my favorites right into this gorgeous sandwich. Bacon and eggs? It’s got ’em. Cinnamon bun? Oh yea, that’s the main event. 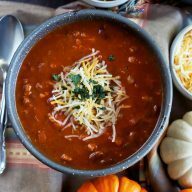 Magic sauce and gooey cheese? Well those are just icing on the… sandwich. All you have to decide is how to cook your eggs! I leave it completely up to whether I’m eating it on the go or not. On the go = scrambled. At home on a lazy Sunday = fried, all the way. This guy is gonna last me all freakin’ day up on the slopes so I can make the most of my day! The ideal day? Stuff my face with one of these, take a cat nap in the car and when I wake up be ready to hit the mountain and not fall on my face. Now to find some friends to drive while I nap… If I make you one of these sandwiches, are you in? Oh yes, I’m willing to resort to bribery so I don’t have to venture out on the slopes all by myself. And I’m completely ok with it. 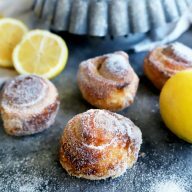 My ultimate way to start the day with everything you love about breakfast in every single bite! 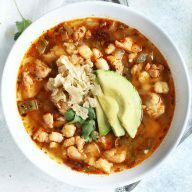 In a small bowl, mix together the ingredients for the magic sauce and set aside in the refrigerator until ready to serve. Butter the cut sides of both cinnamon buns and place on a baking sheet, cut sides facing up. Toast the buns under a broiler set to low until golden brown. Remove the top halves from the baking sheet and set aside. Add one slice of cheese to each bottom cinnamon bun half and melt cheese under the broiler. Once melted, remove from oven and set aside. In a medium skillet over medium heat, cook eggs to your preference. You can do sunny-side up or fried (that's my personal fav), but you can also do a pile of scrambled eggs if you're in a bit of a hurry and don't want to worry about broken yolks (this especially applies if you're taking these to-go!). 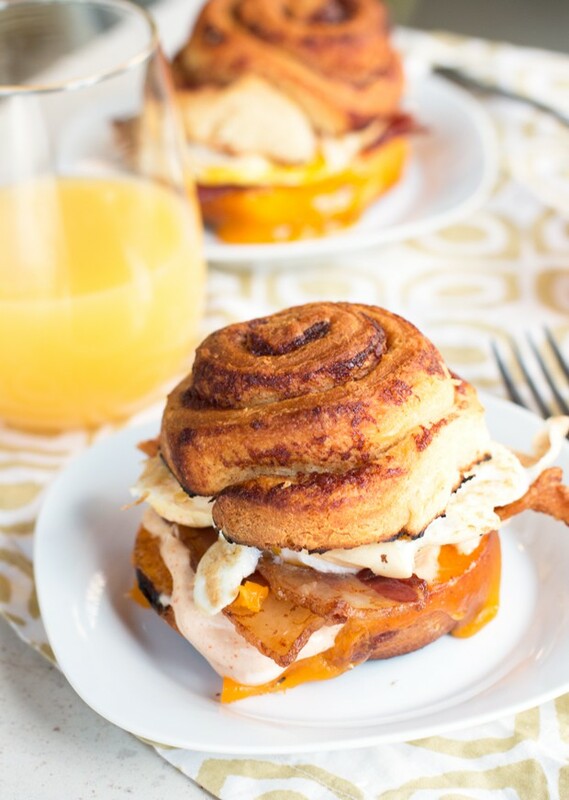 To assemble, spread a generous Tbsp of magic sauce on all cut sides of the cinnamon buns. Top the bottom halves with bacon, then the eggs, and finally the top half of the bun. Serve immediately. You’ll just have to come on out to CO so I can make you one! ???? Holy gloriousness this is amazing! 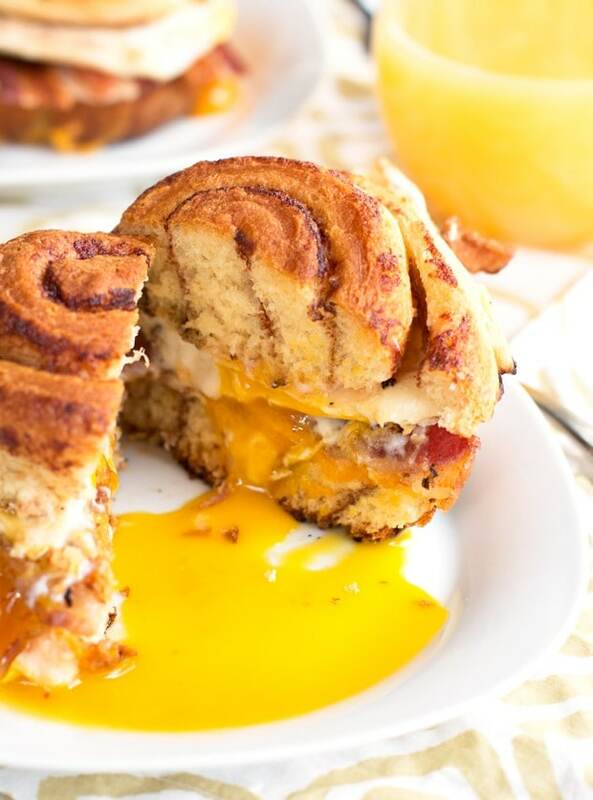 From the cinnamon roll as the bun to the crazy runny yolk everything about this is right. Haha right?! It’s the only way I’ll start my morning now!